Calpains are an intracellular Ca2+-dependent cysteine proteases found in almost all eukaryotes and a few bacteria. Calpains modulate functions of their substrates by limited proteolysis, and are thus called "modulator proteases." Human have 15 genes for calpains encoding a variety of functional domains and showing distinct expression patterns. As calpains play essential roles on maintaining homeostasis of tissues/cells they expressed, calpain deficiencies result in various defects, including lethality, muscular dystrophies, and gastropathy. 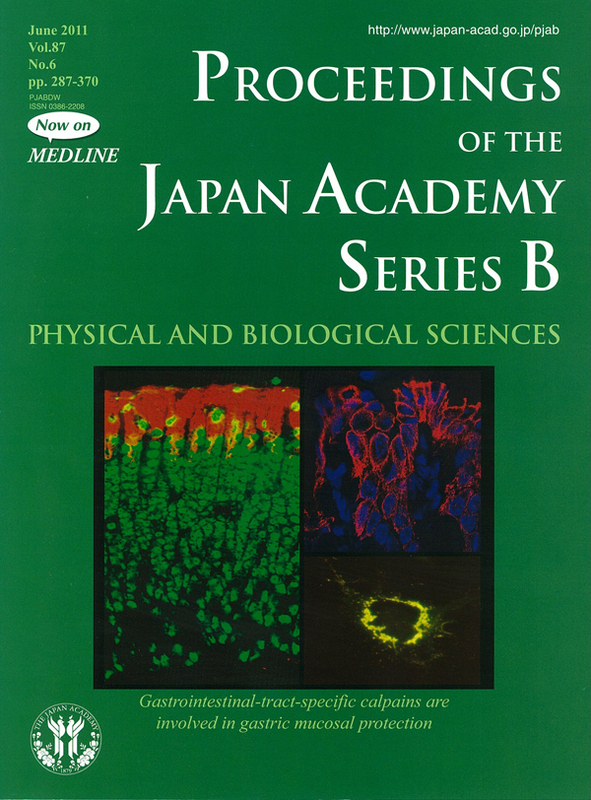 Calpain studies started focusing on ubiquitously expressed conventional calpains (CAPN1/µCL and CAPN2/mCL), in which Japanese researchers such as Imahori, Sugita, Suzuki, and Murachi played critical roles in elucidating activation mechanism and pathophysiological involvement of them in muscle diseases. In 1989, a third calpain, which shows tissue-specific expression, was discovered by Sorimachi and Suzuki, breaking ground on a new calpain study field. Various tissue-specific calpains were then identified, and some of them were shown to cause tissue-specific diseases when defective. Sorimachi and his colleagues showed mainly by genetics and biochemistry that muscular dystrophy is caused by ablation of protease activity of skeletal-muscle-specific calpain (CAPN3/p94), and that stress-induced gastric ulcer results from defects in either of gastrointestinal-tract-specific calpains, CAPN8/nCL-2 or CAPN9/nCL-4. 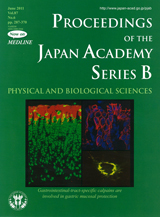 The cover photos show localization of CAPN8 in the mouse stomach (left and upper right (a magnified view of the surface region of the left) panels) and in cultured cells (lower right). CAPN8 (red), anti-H+/K+-ATPase (green, left), and/or HA-tagged β-COP (green, lower right) were stained using specific antibodies, or by TOTO-3 for nuclei (blue). As shown, CAPN8 localizes to gastric surface mucus (pit) cells, which produce mucins to protect the stomach, and, in culture cells, it completely co-localizes with β-COP in the Golgi, showing only yellow signals.